Probifia Pearls Probiotic Supplement: Is This Gem Right for You? 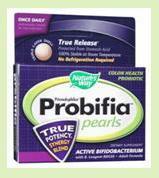 Probifia Pearls Probiotics: Gems or Imitations? Primadophilus Probifia Pearls are marketed by Nature's Way Products as colon health probiotics. They contain 100% Bifidobacterium strains. The total number of bacteria in each pearl is 1 billion CFU. The numbers of each species of Bifidobacterium in the product is unknown. The primary reason to use these probiotics is to support the numbers and types of Bifidobacterium in the colon. Bifidobacterium as a whole help with constipation, colon health, digestive health, immune function and a host of other functions. Here is where you can read more about Bifidobacterium. B. longum BB536 is a well-researched strain. Many of the benefits written about the Bifidobacterium longum species in general are from research done on this strain. However, these pearls most likely doesn’t contain enough B. longum BB536 in one pearl to be recommended for some of the conditions that had statistically significant results with BB536 (such as Japanese cedar pollen allergies or high cholesterol). So my advice would be to use it for general colon, regularity, digestive and immune health. That is why I mention it as possible help for Constipation. And if one pearl doesn’t help, maybe two pearls, one in the morning and one in the evening, will. Of course, always discuss the usage of probiotics and any concerns you have with your qualified healthcare professional. These pearls may be the gems you are looking for! The pearls are made in Japan. The other ingredients as of the time of this writing (always check ingredients before taking) are coconut oil, palm oil, fish gelatin, vegetable glycerin, soy lecithin, pectin and silicon dioxide. They may contain a minimal residual amount of milk protein. So if you have allergies or intolerances to milk, nuts, fish, soy, or any of the other ingredients, then these Probifia Pearls are not for you. Also, the pearls are not certified to be gluten-free, if gluten is a concern for you. No refrigeration is required, but it’s always a good idea to refrigerate probiotics, unless the label specifically says not to. A huge plus for this probiotic supplement is that Nature’s Way has a guarantee that the CFU’s claimed on the label are the numbers at the product’s expiration, not just at the time of manufacture. That’s a really nice feature because many manufacturers will only guarantee the numbers of active bacteria or yeasts when the probiotic is first made, and by the time you buy it and use it, you have no idea how many are really viable. Marketing materials say that the pearls are designed with 3 layers to guarantee passage through the stomach and delivery to the intestines. Nature’s Way also guarantees that only the probiotic strains listed on the label are in the product. That’s another nice and important feature because you don’t want any virulent or pathogenic (disease-causing) microbes in a product that is supposed to support your health. Note that as of July, 2018, Nature's Way is no longer distributing this product. There is another all-Bifidobacterium probiotic supplement that may suit your needs in lieu of Probifia Pearls. Read more about Enzymatic Therapy's Probiotic Pearls Adult 50+ on this page. To read about other supplements, follow this link.